The main purpose of French President Nicolas Sarkozy’s trip to Poland was to try to urge Warsaw to drop threats to veto a new European Union treaty meant to replace the stalled draft constitution. An honor guard and military band greeted Sarkozy outside the Polish presidential palace in downtown Warsaw before he and Polish President Lech Kaczynski moved inside for talks. Sarkozy, making his first visit to Poland since taking power in May, is likely to face a warmer welcome than his predecessor, Jacques Chirac, who offended many in Poland with his criticism of Eastern European countries' support for the U.S. position on Iraq ahead of the 2003 invasion. Poland is a strong U.S. ally, with troops in Iraq and Afghanistan, and it welcomes Sarkozy's plans to revive the trans-Atlantic ties that chilled with Chirac's opposition to the Iraq war. But the fresh start does not mean that everything will be easy. Sarkozy makes his one day stop in Warsaw with the hope of persuading the president and his twin brother, Prime Minister Jaroslaw Kaczynski, to accept a new, streamlined EU treaty to replace the stalled draft constitution. "I will try to persuade Polish leaders that Poland has become such an important country in Europe that we need ... to obtain her consent to a compromise in the form of a simplified treaty," Sarkozy was quoted as saying in an interview published Thursday by the leading daily Gazeta Wyborcza. In Wednesday's edition of Gazeta, Sarkozy was quoted as saying, "Poland cannot block the European Union. ... If every one of us shows total intransigence ... the question arises: what are we doing together?" The French president also said his personal ties to Eastern Europe allow him to better understand the "dreams and aspirations" of the region. "My father is a Hungarian. 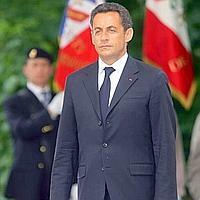 I understand the soul of this part of Europe," Sarkozy was quoted as saying. "Let's not forget that for 50 years we Western Europeans left Eastern Europeans alone. Behind the wall. Today, they want peace and affluence within the framework of the EU." Despite the Polish government's frequent tussles with the EU, Sarkozy said "there may not be another country as pro-European as Poland." Warsaw's threatened veto, an attempt to retain more votes in relation to larger EU members, is seen as a main obstacle to reaching an agreement at an EU summit next week. The country of 38 million is calling for a voting system that would strengthen the voting power of medium-sized countries.